I started this a long time ago.. but then never got to finishing it because of issues that came up during the time I was doing it..
At any rate this is the start of my bee mod.. All you need to do to see it working is plant a yellow flowers, then build a bee box with in 5 spaces of it.. and the box will send out bees to the flowers, and eventually produce honey. This is my first attampt at having living-item interaction that looks nice.. even if it isn't actually necessary. Also Yeti-chow made me the sprites that are currently being used - so credits to him for those. Must be next to working bee box/full bee box. Fruit tree bees - stores fruits - breed with fruitbox add on + fruit tree type (apple pear banana). Fighter bees - attack enemies around hive - breed with gaurdbox add on + blue yellow and red bee boxs. Ore bees - Gathers ore.. - breed with ore bee add on + ore + ore bee box..
Guard bee box functions as a trap and can be upgraded with strong bees or poison bees..
- Spawns bee swarms that fly around the hive protecting the area. - Upgraded spawns stronger bee swarms that fly around the hive protecting the area. 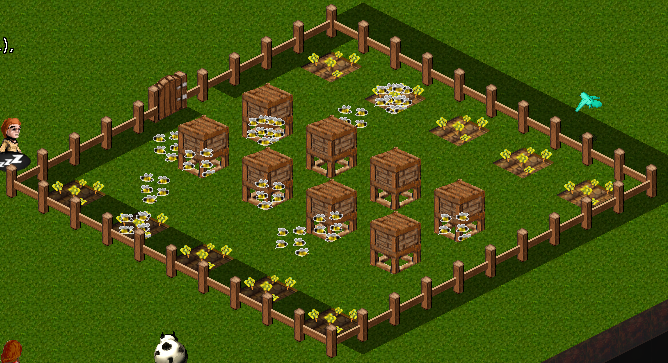 - Upgraded spawns posion bee swarms that fly around the hive protecting the area. - Barrack compartments to spawn more bees (must be upgraded seprately). -Compartments are only used when bees fill there bee box..
-Bees can preform mulitple compartment tasks at the same time but may fail to..
-Removing compartments once they are not needed will make room for more productive compartments..
-Some compartments will only maxage if the right conditions are around..
Breeder compartments will maxage as long as it has a full bee box and nearby plant it is to work with (ie red flower bees need a full yellow beebox + red flowers to happen). Produce compartments will fill up after bees finish filling the bee box..
Guard bees may fly far away to other bee box compartments of the same type.. Flower searching bees likewise may fly further away..
Maxage limitations will heavily cause conflicts bettween compartment and beebox.. unless maxageneeditemANY happens..
APS complexity due alterations to plants and types of honey..
Plants that can only maxage if they have bees... like nut trees. This mod is more a cosmetic thing, as it I think works better if you don't try to design it for mass production/sweetshop layout.. but I haven't really tested it. I am not really releasing it as a full mod though atm just a demo? I guess.. I might continue it. Looks cool! Doesn't work with Towns++ so I can't test it out, but I noticed the comments in your graphics.ini are wrong. They should be "#" Not "<!-- -->"
Oh no, not the bees! NOT THE BEES! AAAGGH! LittleMikey wrote: Looks cool! Doesn't work with Towns++ so I can't test it out, but I noticed the comments in your graphics.ini are wrong. They should be "#" Not "<!-- -->"
I use <!-- -->, cause that is what the devs always use to tag something out in the xml's.. same with the bee requirement in the actions.xml on the beebox. - I have always used it for all comments in mods - it doesn't mess anything up so it still works fine in the graphics.ini. and yeah any mod that changes how yellow flowers work would make this not work.. but if yellow flowers are not changed, I don't see why it wouldn't work... I have never used Towns++ though so I don't really know what it does. Yeah the XML comment tags are different, I guess that if it was a problem then you'd know already. LittleMikey wrote: Yeah the XML comment tags are different, I guess that if it was a problem then you'd know already. I checked back to .42v of towns, and the tag was a ; back then.. don't know when it was changed to # though.. I thought maybe they were using <!-- --> at some point but maybe not... but all my mods always used it so its always worked..
Also I think all you need is an item called "<plantedyellowflower>" for it to work... because the mod adds a maxage to these, that triggers the whole beebox cycle..
What I'd like to be able to do is actually have the bees be functional.. The issue is there isn't enough living-item interaction possible.. Right now I just use spawn to spawn baits, that the bees follow.. and this lets them fly to flowers, and then back to the box.. but it has no practical value, its just an aesthetic.. Only the beebox and the flowers are actually interacting.. If you could make the flowers actual change by the bees touching them, then touching the box to fill it - that would be pretty neat.. Something like... Bees collect pollen which they drop off in the box, slowly filling it to max which then produces the honey.. This would be possible with some.. living tags to maxageneeditem and item tags that maxeageneedliving.. - I think it could be possible.. I am not sure though how many things you can apply that stuff to that would be practical/interesting beyond just... being neat..
Of course it's pointlessly complicated, it's just realy fun to come up with the voodoo theory for how to do it But as you say, it would be awesome if livings could interact with objects.... badgers stealing berries, more interesting door interactions, and even the fire idea would be better (instead of a fire item, there could be a fire living that destroys wooden blocks... and then townies can fight the fire...) if livings could be used.